One of our interests is in how sequences of practices may contribute to patterns of energy demand and we are exploring a number of ways to both visualise and analyse such sequences. 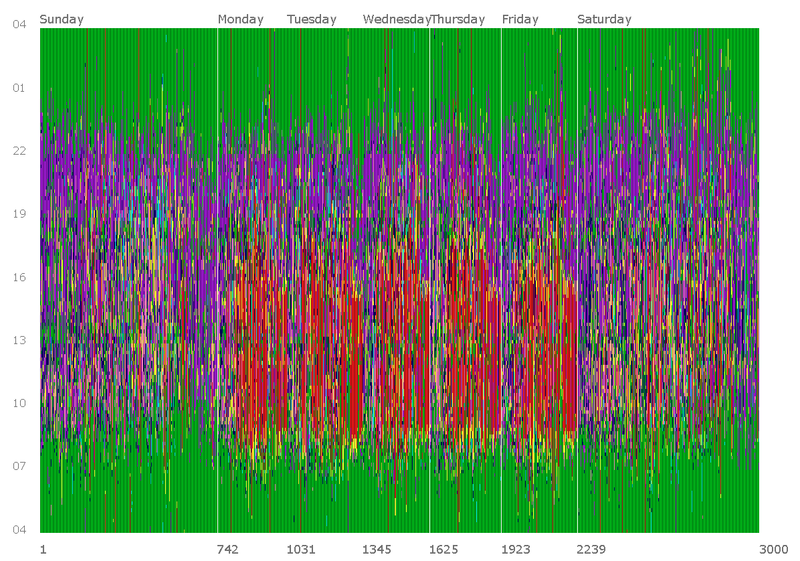 The image shows a visualization of a random subsample of 3000 diary days from the UK Time Use Survey 2000 in the Visual-TimePAcTS software. 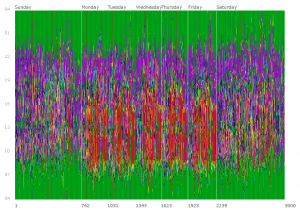 The diary days go from 04:00 (bottom) to 04:00 the next day (top) and are ordered by day of the week (left to right) and, within days, by age of the respondent (left to right). The different types of activities (at the most aggregated level) are depicted with different colours: ‘care for oneself’ (green), ‘care for others’ (light blue), ‘house keeping’ (pink), ‘reflection / recreation’ (purple), ‘transport’ (yellow), ‘procure and prepare food’ (dark blue), ’employed work / school’ (red). Several interesting patterns are visible even at this level of aggregation such as shorter working hours on Fridays, longer recreational activities on Friday and Saturday night for twenty-somethings and longer sleeping hours for children on weekends. This entry was posted in Data Bytes and tagged demand analysis, patterns, sequences, social practices, Theme 1, time, time use. Bookmark the permalink.